We all know that President Trump signed a $1.5 trillion tax cut into law in December, which was deemed the first significant tax reform signed into legislation since Ronald Reagan back in 1986. We also know that all the talk last earnings season was that companies felt good about their future prospects from this tax law and the promise of less regulation from Washington, D.C.
That’s also why many companies offered some nice bonuses to their employees and raised their earnings guidance, with some even announcing share buybacks. But we’re entering a new earnings season, and this optimism may not necessarily help drive the markets higher. It didn’t help all stocks pop higher the last time around, either. And when it comes to the markets, this next round of earnings could make or break volatility – and your trades. Once you’ve got that down, the question then becomes which strategy should you use. So how exactly do you trade around earnings without facing the risk of a completely unexpected outcome? A straddle is an options strategy you’d use to profit during earnings season and also during times of market volatility. It involves buying both an at-the-money (ATM) call and an ATM put with the same strike price and the same expiration. An option that’s at-the-money simply means that the stock price and the option’s strike price are the same. Straddles are actually the most popular way to play earnings and market volatility because they allow you to profit when the stock moves up or down. You can think of it like “straddling a fence,” having one leg on each side. And since there’s no limit to how high a stock’s price can go, your profit potential is virtually limitless. When I am looking for companies to trade during earnings season, I turn to my proprietary set of tools. These tools analyze years of data and equip me with the best information going into such an unsure time. The very first thing I do is look at the price, action, and percentage move on average in implied volatility (IV) over the past 10 years. Knowing the average percentage move in both price and IV can help me determine first and foremost if trading options on a certain company is worth it going into earnings season. Following this, I look into the averages on both sides – and that allows me to plan accordingly. This will allow me to plan out a timeline for the trade – for example, should I trade with the intent of getting out just before the announcement, or stick around and risk it for a big reward? If you’re new to options – or don’t have the proper tools to provide you with this data – my advice would be to take the profit or loss prior to the earnings announcement. Waiting until after the earnings call is a risky game to play without advanced education. And though at times there may be a stock that pops and you find yourself wishing you had held it over earnings, more often than not, if you wait, you will find yourself in the exact opposite position – and lose all or near 100% of the money you invested. Below I have put a snapshot of what stocks have beat their earnings estimates over the past handful of quarters. And as you can see – it’s not a ton. And while these stocks have beat the estimate five out of the last five quarters, I encourage you to look deeper into the data to make the best decision. Because in this market, nothing is guaranteed. And this is where I will return to my original point – using a straddle is the most financially secure choice you can make in these uncertain times. And while it may cost more to initiate this type of options trade, you will have a much higher probability of profits by trading this way. And instead of sticking to a bullish or bearish stance, you can avoid feeling like you have to decide which way a stock will go and instead analyze the price move going into and after an earnings announcement. Use the company’s last three or four quarters as a beginning point. That way when you are contemplating a straddle, you can choose your strikes based on how far you think it will move, regardless of whether the move is higher or lower. Companies you feel will move far enough one way to cover the cost of the straddle and get to profits are the ones that you are likely to see making the big, wild price swings most of the time, like the FANG stocks: Facebook Inc. (Nasdaq: FB), Amazon.com Inc. (Nasdaq: AMZN), Netflix Inc. (Nasdaq: NFLX), and Alphabet Inc. (Nasdaq: GOOGL). And while that is not necessarily untrue, also remember that their share price is high and therefore their option prices will be high as well, so to buy two options, a call and a put will be costly. My concern this quarter with Facebook is all the investigations and potential regulations that surround it. They may report great earnings and revenue and pop, but be careful of an immediate drop due to this overhanging news. 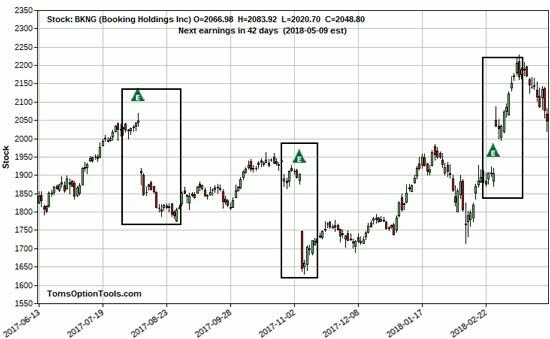 Now, I’ll show you what I’m talking about with a company that is one of my favorites around earnings: the giant formerly known as Priceline.com but recently rebranded as Booking Holdings Inc. (Nasdaq: BKNG). It has a tendency to move a significant amount, whether it be higher or lower. And if you look closely, you’ll notice that the average price move is in the $150-point range. Now, to execute a straddle trade, you would a find a call and a put option at the money or near the money where the combined cost is at least less than that. If it gives another point move of that amount or near it, you might be able to see the stock get in the money enough on the call or the put to not only cover the cost but be profitable. The last thing a trader wants to do is place a trade and live with the fear of the unknown. But by being educated and prepared for the unexpected – you are in control. As you might know, besides making money, my biggest passion is computers and programming. I discovered something not one in a thousand people know about. Even bankers, traders, and hedge fund managers don’t know how to spot the lucrative patterns fueling my strategy. And today, I’m sharing all the details about this. Click here now to see it in action. The post Unlock Unlimited Profits on Your Next Earnings Trade Using this Simple Strategy appeared first on Power Profit Trades.